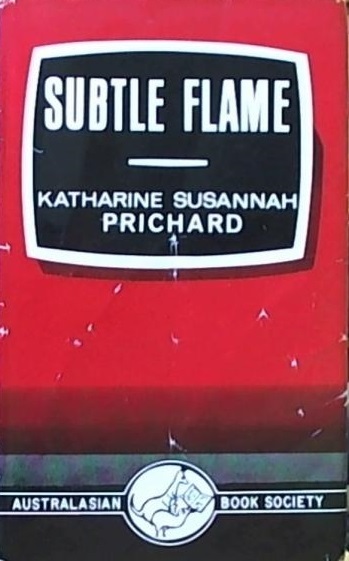 It’s with some sadness I’ve finished reading Katharine Susannah Prichard’s final novel, Subtle Flame (1967). I still have to go back and read two earlier, obscure novels (Windlestraws and The Moon of Desire) in the rare book room of the library, but, chronologically, I’ve come to the end of the line in my long running reading project. It was an astonishing accomplishment for Prichard to publish a novel at the age of 83 after having suffered a stroke, and I’m full of admiration that it exists at all. Unfortunately, Subtle Flame is one of her least successful novels. More than any of her novels, it exists to argue a cause – the very worthy one of world peace at a moment in history when nuclear annihilation seemed imminent. However, despite its shortcomings as a work of fiction, it is of great biographical interest and has flashes of Prichard’s great powers as a writer. The protagonist is David Evans, a successful newspaper editor who receives the shattering news that his son Robbie has been killed in the Korean War. It sends him on a pilgrimage, as he leaves his wife and three other adult children and his job to discover a worthy cause to devote himself to. Converted to the cause of peace by his reading, he embarks on a one-man crusade to stir the apathetic masses to action. His path leads him into poverty and at his lowest, he is taken in by a former employee, Jan; he abandons his idealism for an affair with her and to work on the woman’s magazine she has started. Yet when he recovers he returns to the cause and the more pure love of Sharn, the tireless, nun-like activist. His work is interrupted by various small crises, but most notably his entanglement with a young drug addict whom he is trying to save from the other criminals. He ends up in jail; emerges to suffer a stroke when attacked by hecklers while giving a speech, only to recover enough to finally consummate his love with Sharn and promise to marry her. It is a novel which neglects its own dramatic potential, shown particularly in its failure to examine David and Claire’s marriage. David walks out on Claire to pursue his Samaritan mission of self-discovery; when she dies before he has even spoken to her again, his reaction is muted, and the event seems to have left him largely unaffected. The novel does attempt to show the pull between the demands of trying to change the world and those of helping individuals in trouble, but only in the character of Tony, the drug addict; the consequences and meaning of a man walking out on his family responsibilities to pursue this dream are only lightly tapped. Prichard was a journalist herself before she became a novelist, as were her father, uncle, and brother. So it is quite incredible that it is only in her final novel that she explores journalism as a theme. Through the mouthpiece of David, she shows the possibilities she saw in journalism to influence society. Like David, she no doubt came to see the objective stance expected of the journalist inadequate. He attempts a new kind of journalism, not merely detailing the facts but “devising an intellectual bomb which would blast the apathy of readers, stir them to seek further information and to ally themselves with movements already pressing for the abolition of nuclear weapons: the prevention of atomic war” (44). David’s embarrassment (181) about editing Girls to make ends meet echoes Prichard’s feelings about writing the “Women’s World” page in the Herald from about 1909 to 1911. It is also the first novel of hers to be set in Melbourne, the city where she lived for most of her childhood and early adulthood. The city is significant as a setting, with David walking the streets of the city centre and the suburbs, and Prichard taking particular care to evoke the criminal-ridden slums, especially in the drugs subplot. In his monograph on Prichard, A Gallop of Fire, Jack Beasley notes that Prichard did not revisit Melbourne to research the novel and sees that “the atmosphere is redolent of Katharine Susannah’s youth, of that Edwardian horse-drawn Melbourne” (170). He seems to have put his finger on something significant, with the action of the novel drawn from the headlines of the 1960s – world conflict, drug addiction – but the fictional world seeming to not quite fit it. This interpretation is highly speculative, and few works of fiction can be reduced to a simple, singular genesis. I suggest it only as a possible psychological meaning of the plot which rings true with the deep influence THP had on Prichard in life and death. It also suggests a way in Prichard’s mind the death of Alan could have done good, in spurring others on to fight for a better world. Prichard’s own complete commitment to communism came soon after Alan’s death. In itself, this reminds us that the biographical elements are unstable and polyvalent. David’s journey could relate to Prichard’s wish for THP, but it also mirrors many events in her own life and those of others. Subtle Flame is not one of Prichard’s novels likely to find a continuing audience, but is a fascinating coda for those interested in her life and work. It was translated into Russian, but has never been reprinted in English. A contemporary review, a little too harsh but quite insightful, can be found on Trove from The Canberra Times. This entry was posted on Tuesday, March 24th, 2015 at 4:22 pm	and tagged with Subtle Flame, Thomas Henry Prichard and posted in book review, Katharine Susannah Prichard's writings. You can follow any responses to this entry through the RSS 2.0 feed. It is easy to forget now how frightened we were in the 1950s and 60s of a nuclear war leading to the end of the world. I would imagine that KSP, a lifelong activist, would probably have seen the effort to produce one last novel arguing such an important cause as her duty. Absolutely! I understand why she wrote it and how important it was. I want to write up a follow up post on just how hard it is to write a political novel for a cause. Reading it now and it has some flaws but easily overlooked if you’re a tragic like me about Australian writing. And that we’re living through a demise of the newspaper as we gallop towards the modern information zone of the web makes it very topical.